Giving the exterior of your home the deep cleaning it needs is easy when you select a top-quality electric pressure washer from Ace Hardware. Eliminate years of dirt, mildew and grime from your home's siding, shingles, tile, pathways and more in a matter of minutes to increase your home's curb appeal and freshen up your space. Browse our selection today to find the right pressure washers, accessories and chemicals you need to make your home look like new. Ace Hardware makes it easy to select the right pressure washer for your project at a price that works within your budget. With so many to choose from, the bar on the left side of the screen is a great way to narrow down your options. Select your favorite brand, the desired price range, and a little information about your intended uses and you'll be left with the tools you need to get the job done right. Helpful Hint: Find a pressure washer with wheels and handles to easily maneuver them around your space. For tougher spots that are harder to reach, shop smaller models to get the job done. Tackling your household chores is easier when you have the right tools for the job. Pressure washer accessories like spray nozzles and high-pressure extension hoses easily attach to your unit to complete your heavy-duty projects with ease. Browse our array of accessories to find the right nozzles and parts to deep clean specific areas of your home's exterior. The rich cleaning chemicals will help you refresh the look of your home, deck and pathways. Concentrated solutions mix with the water in your electric power washer to degrease, remove mold and strip paint from the areas you want to clean. Each product is formulated to provide specific results, so it's important to check out our entire collection to find the products designed for your project. Annual pressure washing of your home's exterior areas enhances curb appeal and significantly prolongs the life of your decks, siding and cement. Having a reliable electric pressure washer on hand helps you make easy work of many household chores. Use them to strip chipping paint from your wood decks, provide a deep cleaning of your driveway and walkway, and remove mold and mildew from the side of your home. 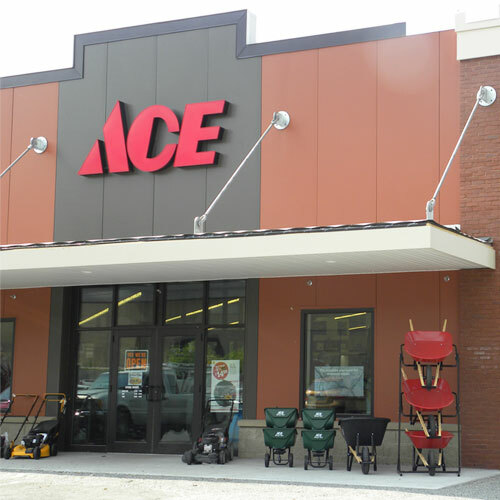 Stop by your local Ace Hardware today to find all the pressure washing equipment and accessories you need to complete your home project. Our helpful staff is happy to assist you in finding the right tools for all your outdoor chores and ensure you finish all your projects with ease.